Many law firms treat you like a number. They get you through the legal process as fast as possible. They treat the practice as an assembly line. Unfortunately, they do that to maximize their own profit margins – not to get you the fair money you deserve for your injuries. At Mullen & Mullen, we understand how important your case is to you and that it is unique to you. That’s why we offer individual attention and make sure your case is treated with the same care we would demand if we were in your shoes. Unlike many other law firms, each attorney on our team is personally responsible for your case, and assists in your case’s entire preparation and development. This means you get timely responses to all your questions and that the attorneys are aware of any changes in your case as they happen, At a “volume firm” the attorney often is not aware of potentially damaging issues until it’s too late to properly address them. At Mullen & Mullen your attorney will constantly oversee and monitor the development of your case. You want to talk to your personal injury attorney, and not the paralegal. Our personal injury attorneys genuinely enjoy meeting with clients and always take the time to understand the unique ways injuries have impacted their lives. We recognize that effective and meaningful attorney-client communication leads to better results on cases. Most attorneys like to talk. We like to listen to you. You’re in a vulnerable state after any personal injury, and especially after a serious one. You want someone to listen to how you’re doing and reassure you that everything will be okay. Not only does that help you cope with the stress you’re facing, but it’s helpful once we have to negotiate with the careless party that caused your injuries. Medical bills and records are part of the evidence that support your case but the most important factor in your case’s outcome is the actual impact your injuries had on your life. Listening to our clients helps us more effectively advocate for our clients. Shane V. Mullen*, Regis’s son, learned personal injury law from his father. Today, he’s been recognized as a “Super Lawyers Rising Star” in the state of Texas from 2014-2016. That means he ranks among the top 2.5% of all personal injury lawyers under 40 or with less than 10 years of experience. He also belongs to the Million Dollar Advocates Forum (you must win cases with a value of at least $1 million to be a member) and Rue Ratings’ Best Attorneys of America. Mike Foster has been employed with us since 2011 as a private investigator. 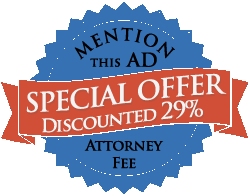 Most law firms contract these services out and pass the fees on to you. However, we provide his services at no additional cost to you. You’ll meet Mike or another investigator soon after you choose us to take your case on. You’ll love his friendly compassionate demeanor. We also have skilled and experienced staff ready to help you handle your case. You can always talk to our personal injury lawyers free by contacting us online or calling 314-465-8733 (314-INJURED). We’re happy to help you decide what direction to go with your case. And there’s no pressure to hire us on the spot.